This one was a bit of a challenge until I finally found a solution – after HOURS of work. In my case this was a problem as the FW was blocking unknown URLs and would not let anything non-defined through. I tried everything – all sort of combinations of redirects to redirect to another redirect, to substitution rules… the query was always appended to the end of the resulting URL and the FW was rejecting me. I even redirected to an IBM HTTP server to use the rewrite capability – which is when I had an epiphany after 8 hours of straight work: In Apache, when doing a re-write, you can add a [?] to the end of the rewrite and it will cause any queries to be stripped from the resulting URL. I jut thought … let’s give it a try and …. it worked! The redirector rule is otherwise standard. You can match any incoming URL patters using asterisks etc. or point it to other redirector results. 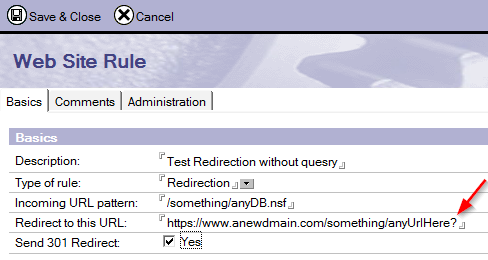 You can also point to a local URLs by changing the [Redirect to this URL] to string that the Domino server will resolve locally such as [/anyfolder/adifferentDB.nsf?] or a URL created by another redirector such as [/NewSiteHere/Results?] – and by adding the [?] in the end any query like function (i.e. the very common query [?Open] appended to the end of a dB in a URL] will be stripped from the resulting URL.